Henry VIII had six queens: divorced, beheaded, died, divorced, beheaded, survived. But the real reason that his reign was so important in English history is of course that he initiated the English reformation, a momentous change with very far-reaching consequences. And Henry’s interesting marital career was essentially part of that larger process, set in train by the will of a powerful king. Well, for that reason the English reformation was once famously described as being essentially “an act of state,” its essence being the transfer of legal authority over the church in England from a distant papacy to a very present English crown. The universal Catholic Church in England became the Anglican Church of England. So an act of state, and an act of state it certainly was. It was initiated by the crown and directed from above and carried through by successive acts of Parliament. And yet it was also, of course, so much more than that because these acts of state also inaugurated fundamental changes in the religious culture of the nation. 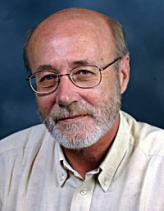 Looking at the whole, it’s certainly possible to distinguish, as Christopher Haigh does, a series of legislative reformations, on the one hand, and to distinguish that from, on the other hand, what he terms the Protestant reformation, which was a much more gradual and much more diffuse process of religious change extending over generations. And yet the two dimensions of the reformation, the legislative and the Protestant, inevitably went together. What was once seen as being a very purposeful process of change — carefully directed, swiftly accomplished — now tends to be seen as a much more hesitant and uncertain business, but to call the whole thing, as Christopher Haigh, does “a series of blundering steps” is perhaps to go a wee bit too far, because there certainly was purposeful action and the reformation process became much more deliberative over time as the issues gradually became clearer and as the religious alignments to which it gave rise gradually crystallized. Christopher Haigh’s account of it all provides us with an excellent overview, the details of which take the narrative up to 1603. But what I want to do in the lecture today is to emphasize the contributions of each phase of development in the crucial generation from the late 1520s through to 1558 — the various stages which contributed to an emerging religious division — and I want to try to bring out the logic of those phases of development. All of this can be very confusing in the details, but there is a certain logic to it. And that means in the first instance grasping how successive political situations gave rise to particular developments which had consequences for religious change, one way or the other, and then later on in section discussion we’ll explore further the larger question of the extent to which these changes were welcome or unwelcome for the people at large and the very gradual process of their acceptance. So let’s look at the first phase which ran roughly from 1527 to 1531, which we can call a gathering crisis. Well, if there was a phase of blundering about, as Christopher Haigh puts it, then it came at the beginning, and it was occasioned of course by the fact that the King and his advisers were facing a completely unprecedented situation in 1527. Henry needed a male heir, as you know. The future of the Tudor dynasty and of the political stability which it had reestablished might hang on that fact of an undisputed succession. Henry was thirty-six. His wife, Katherine, was in her early forties. No child was now likely. Now, as you know, Katherine had originally come to England as the bride of Henry’s older brother, Arthur, who had shortly died and she had subsequently married Henry. Brooding on this, Henry by 1527 became preoccupied with a biblical text, Leviticus 20:21, which translates as “if a man shall take his brother’s wife it is an unclean thing. He hath uncovered his brother’s nakedness and they shall be childless.” And at the same time, on a somewhat less principled note, Henry’s eye had been caught by a young woman of the court, Anne Boleyn, whom he saw as a potential new queen. She was in her early twenties, vivacious, ambitious and astute, and she was not willing to be the king’s mistress; she intended to be queen. So Henry needed to get his existing marriage dissolved. He needed it to be declared void from the beginning by the Pope and to take a new queen, and it should have been very easy since popes were usually willing to cooperate with the needs of kings in such matters. But it was rendered difficult by two factors. First of all, Katherine was a very strong personality. Her sense of honor was outraged by the idea that her marriage should be dissolved in this way, and in 1527 as matters began to reach a head her nephew, the Emperor Charles V of the Holy Roman Empire of Germany, gained control of the Pope, Clement VII, in the course of his Italian wars. Now all Henry really needed was a delegation of authority from Rome to settle the matter and in 1628 [correction: 1528] it looked like he might get it. In that year a papal ambassador, Cardinal Campeggio, was sent to England and he and Cardinal Thomas Wolsey were empowered to establish the facts regarding Henry’s marriage, but in hearings that they inaugurated in 1529 Queen Katherine vigorously defended the validity of her marriage. She denied that there had been any sexual consummation to Prince Arthur, Henry’s older brother. She embarrassed the King by publicly declaring that he knew she had been a virgin when they married. She defended her honor and her marriage. And then in July 1529 new victories of the Emperor in Italy meant the Pope was even more firmly under his control and the Pope revoked the case back to Rome. So the first phase of the developing crisis was efforts to put pressure on the papacy by threatening the privileges of the church in England in order to get the Pope to cooperate. 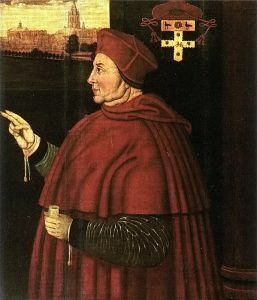 In September 1529, Cardinal Wolsey, who had clearly failed Henry, was threatened with the legal charge of praemunire, which was an offense established by statutes in the fourteenth century regarding the jurisdiction of church and state within England. He had allegedly illegally exercised his powers as the pope’s legate in England. And a couple of months later Parliament was called and the members of Parliament were encouraged by royal counselors to lay complaints not only against Cardinal Wolsey but also against other alleged abuses in church affairs. So, at this stage Henry is blustering, he was deliberately stoking up the latent resentment of clerical privileges amongst members of Parliament, but as yet there was no intention to go further. Indeed, having set things going in this manner, fired his warning shots as it were, the King sent Parliament into recess between December of 1529 and January of 1531, and in the meantime he assembled a think tank of academics and clergy to prepare his legal case for a divorce. And he began consulting learned opinion amongst lawyers and theologians from Europe’s various major universities. But none of this had the desired effect and in 1530 the Pope cited Henry to appear before him in Rome and forbade him to remarry until he did so. The King was both frustrated and furious, and he found reasons to fail to comply with the Pope’s requirements in the materials which were being assembled by his academic research team. These survive and they’re known as the Collecteana and they included some crucial arguments. One was the argument that historically the church in England had exercised independent provincial rights. That’s to say it had the right to autonomy in the settlement of certain internal affairs without reference to Rome. The second crucial argument, which they put forward, was that within England the king enjoyed imperial power, not only over the state but over the church in matters which were not of a strictly spiritual nature. So Henry, still hoping for a change in the European political situation which would lead to papal cooperation, used these ideas to put a bit more pressure on the church. In 1530, his lawyers indicted the entire clergy in England for praemunire, illegally acquiescing in the exercise of papal authority. The convocation of the church, meeting in Canterbury, resisted and Henry demanded that they recognize his supreme headship of the church. And they eventually did so. They recognized his authority but only “so far as the law of God allows,” a saving clause, and they gave the King a grant of 120,000 pounds from the church to try to sweeten his mood. So where are we in 1531? The King and the church have fallen out badly over Henry’s need for a dissolution of his marriage. The central issue has been clarified. The central issue has become that of legal jurisdiction of the papacy over the English church and therefore its ability to frustrate his divorce since the church had authority over marriage. But there was no question of any doctrinal challenge to the Roman Catholic Church, no challenge in matters of faith or matters of worship. This is a legal issue at this point: which brings us to phase two, the Royal Supremacy. As 1531 advanced, there was no indication that the Pope was going to give way and the political impasse precipitated the second phase of development, the royal supremacy, and it was masterminded by Thomas Cromwell between 1532 and 1535. Now a brief word on Thomas Cromwell. He was a man of very humble origins, the son of a London cloth worker and tavern keeper. He had had an obscure early career. He’d probably served as a soldier in Germany, he had worked as a merchant, and eventually he went into the law. In the 1520s, he gradually emerged as a very skillful man of business in the household of Cardinal Wolsey, much trusted by Wolsey for his astuteness and competence. And in 1530 when Wolsey fell such was Cromwell’s reputation that he was taken into the King’s service and by 1530 was made a member of the council. And it was Cromwell who saw the way out of the legal impasse through a carefully planned program of legislation. He knew exactly what he was doing. Memoranda in his own hand survive which show the stages of his planning, and in 1532 to ’34 his strategy of making Henry’s divorce possible and then legitimizing these changes was executed stage by stage through the careful presentation of the King’s desires to Parliament and management of Parliament to get them passed. First of all, they put still more pressure on the church to break any resistance within England. Parliament was brought to pass the Act in Restraint of Annates. Annates were payments to Rome which were made when bishops were appointed. This canceled them, but the Act was held in suspension as a threat to papal finance. Secondly, the House of Commons put forward what was called its Supplication Against the Ordinaries, a petition against the exercise of ecclesiastical jurisdiction in the church courts in England and the abuses which allegedly took place. This was an attack which provoked the convocation of the church, its own assembly, to reject the accusations. Henry then rounded angrily on them and demanded their full submission, and in May 1532 they caved in. The convocation submitted and abandoned its claim to legal jurisdictional independence. The way was now clear in England, but there was still no response from Rome and then fate lent a hand. In August 1532, the Archbishop of Canterbury, Archbishop Warham, died. Henry and Cromwell managed to secure the appointment and the confirmation from Rome of Thomas Cranmer as the new Archbishop of Canterbury. Now Cranmer was a Cambridge academic who had taken a great interest in the early development of Protestantism in the 1520s. Henry and Cromwell knew him as one of the King’s think tank and they knew that he was willing to do Henry’s bidding over the divorce. With that confidence, an Archbishop of Canterbury who would do the King’s will, Anne Boleyn at last gave in to Henry’s importunities. By December 1532 she was known to be pregnant and in January of 1533 they were secretly married. The King was willing to go ahead and do that because he was convinced that his first marriage would be declared to have been void. But now with Anne pregnant things had to move fast. In April of 1533, Parliament was brought to pass the Act in Restraint of Appeals, a crucial statute. This declared that England was an imperial monarchy, no foreign jurisdiction was valid within its boundaries, no appeals against a judicial decision made in England could be taken outside the kingdom. And accordingly in May of 1533 Cranmer assembled a court, annulled Henry’s marriage to Katherine of Aragon. And in June 1533, Anne, already secretly married to the King, was crowned as queen, already six months pregnant with the future Queen Elizabeth I who was born on the seventh of September. And in the same month, September 1533, the Pope responded by excommunicating the King, casting him out of the church, but he held the excommunication in suspension in case Henry would begin to behave. But Henry didn’t behave. That wasn’t his way. [Laughter] In 1534, Parliament passed the Succession Act declaring the validity of the annulment of Henry’s marriage and his remarriage and fixing the succession to the crown in the new line. Oaths were required from all major office holders to respect the Act of Succession. 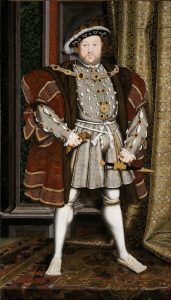 An Act for Submission of the Clergy was passed to legally enshrine the clergy’s submission and finally the Act of Supremacy, which declared Henry VIII to be the Supreme Head of the Church of England. In sum then, the necessity of securing the Tudor dynasty had led to England entering into a state of schism. Schism. They had rejected the jurisdictional authority of Rome, they had asserted the royal supremacy over the church, and in 1534 to ‘5 this was backed up with a flurry of executions of individuals who dared to defend the Aragon marriage and the authority of the pope, and those who were executed included John Fisher, the reforming Bishop of Rochester who could not tolerate this, and most famously Thomas More, the former Lord Chancellor, former good servant of the King, who also could not stomach this and died for it. So we now enter a third phase, the Henrician Reformation. Now on the face of it, the royal supremacy over the church had nothing whatever to do with religious reformation. It was a rejection for reasons of state of the supposedly usurped legal jurisdictional powers of the Bishop of Rome, but it had nothing to do with Protestantism and it was not intended to inaugurate reform in matters of faith or worship. But of course it did. It took place in a context of the reformation in Europe. It aligned England against Rome, if not necessarily with the Protestant princes of Germany, or the Protestant cantons of Switzerland. It gave an initial foothold to that minority who favored some measure of religious reform, and there were already people around the King who were prepared to use that opportunity purposefully, though necessarily with extreme caution. 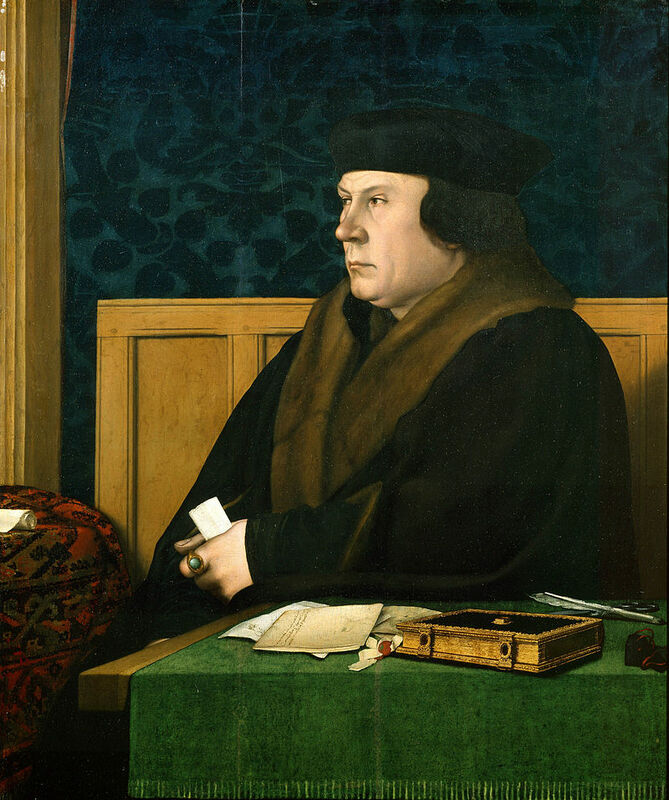 Thomas Cromwell certainly favored reform. Queen Anne favored reform. She received Protestant books which were secretly brought to her by London merchants and read them with interest. Thomas Cranmer favored reform, as he had done for some years. On the other hand, most of the bishops and most of the nobility were willing to go only so far with Henry. They would accept the royal supremacy for the good of the kingdom, for the good of the succession, but they hoped that it would all end ultimately in a reconciliation with Rome. So they would go along for the time being. The key figure in all of this of course was Henry then himself, and once he had the royal supremacy Henry found that he rather liked it. He was happy to adopt the position of a moderate reformer of abuses and over time he increasingly came to believe in his own propaganda. He saw himself as a Solomon, as a Josiah who had promulgated God’s law and purged the land of abuses and idolatry. And at the same time the King was notoriously susceptible to influence and if those who held his trust were able to steer things in the direction that they favored, then the King might back them if they were cautious, though they were always well advised to proceed with extreme caution in order to retain the King’s confidence. He was willing to be influenced but he could react fiercely if he thought he was being abused. Well, in the mid to late 1530s Thomas Cromwell and Thomas Cranmer certainly had the King’s trust. They had served him very well as Archbishop of Canterbury in Cranmer’s case or in Cromwell’s case as Vicegerent in Spirituals, the office of administering the church on behalf of the King. And they did a great deal to mold developments. In 1536, they issued ten articles of faith and a set of injunctions for the practice of worship in the church which moved very, very cautiously in a reformist direction. In 1536, Thomas Cromwell organized a visitation, an inspection, of the monasteries which was deliberately intended to find abuses and which led, later in 1536, to the dissolution of all religious houses worth less than 200 pounds a year, the smaller monasteries. It was not presented as an attack on monasticism in principle but as an attack upon abuses. It was a severe shock and it was one of the issues which provoked in 1536 rebellion in the north of England. That rebellion, which we’ll deal with on another occasion, was suppressed in 1537 and in the aftermath of that suppression the larger monasteries were gradually cajoled and encouraged and bullied into surrendering freely their possessions to the crown. By 1540, every monastery and nunnery in the kingdom had gone. In 1537, Cromwell and Cranmer engineered the issue of the Bishop’s Book, a set of homilies which again moved cautiously towards Protestant definitions of faith. In 1538, the great shrines, the great centers of pilgrimage at Canterbury and Durham and elsewhere were dissolved, their riches seized by the crown, broken up on the grounds that they had been idolatrously abused. 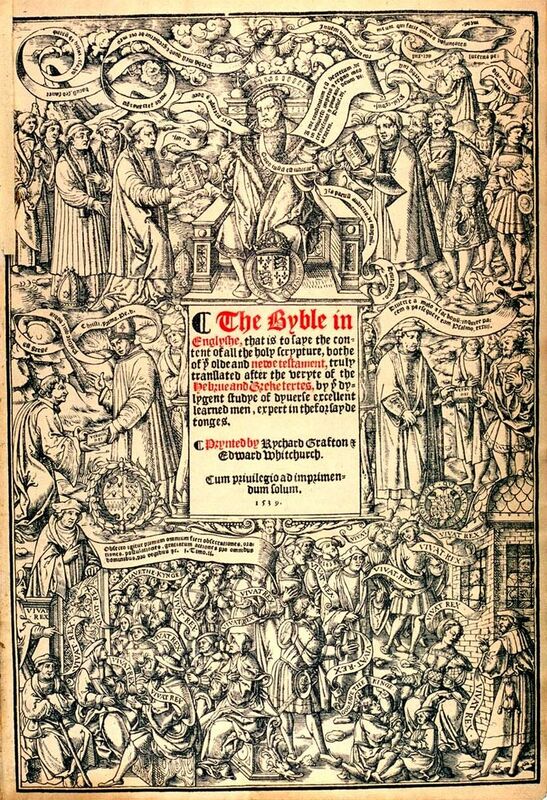 And in 1538 the Bible was issued in English; the Great Bible, a translation into English which was actually based upon the translations of the Bible by William Tyndale and Miles Coverdale, both of whom were Protestants. That was not officially admitted but it was a fact. These were the only translations ready to hand and they needed to produce the Bible quickly. The Great Bible, then, was issued and on the frontispiece, the magnificent frontispiece of the Bible, shows Henry sitting in majesty handing down the word of God to his grateful people. There was not much doubt that by 1539 things had gone a lot farther than anyone anticipated and that elements of reformed doctrine were being gradually smuggled into Henry’s church. But in that year the King called a halt. The situation had changed again. Another of the events of 1536, to go back a few years, was the fall of Anne Boleyn. After her marriage to the King and the promising start of the birth of Princess Elizabeth, no male heir had been born. Anne had suffered a series of miscarriages. She was in a state of acute nervous anxiety, understandably. Eventually, she was suspected. Word was brought to the kKng planting suspicions that she had committed adultery in her desperation to have a child. Other accusations were brought against her. The Queen was arrested and executed, and shortly thereafter Henry married Jane Seymour, another lady of the court. 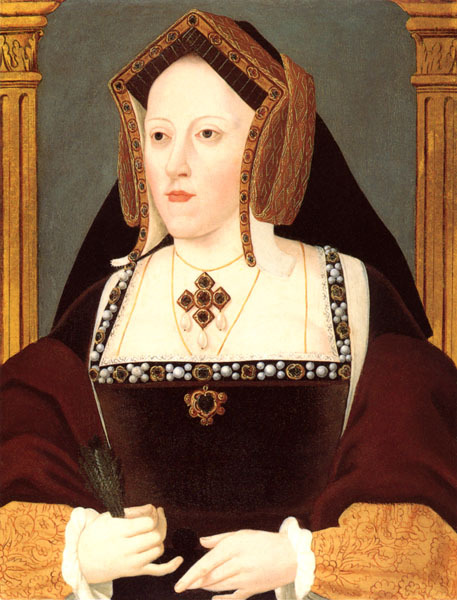 The death shortly after that of Queen Katherine meant that the marriage to Jane Seymour was now of undoubted legitimacy — both of Henry’s earlier queens were dead — and in 1537 she gave birth, at last, to a male heir, Prince Edward. Jane herself died in childbed. So the King had his son. That could have cleared the way for reconciliation with Rome and his more conservative counselors hoped that it would do so quickly, but here again Henry’s personality proved vital. 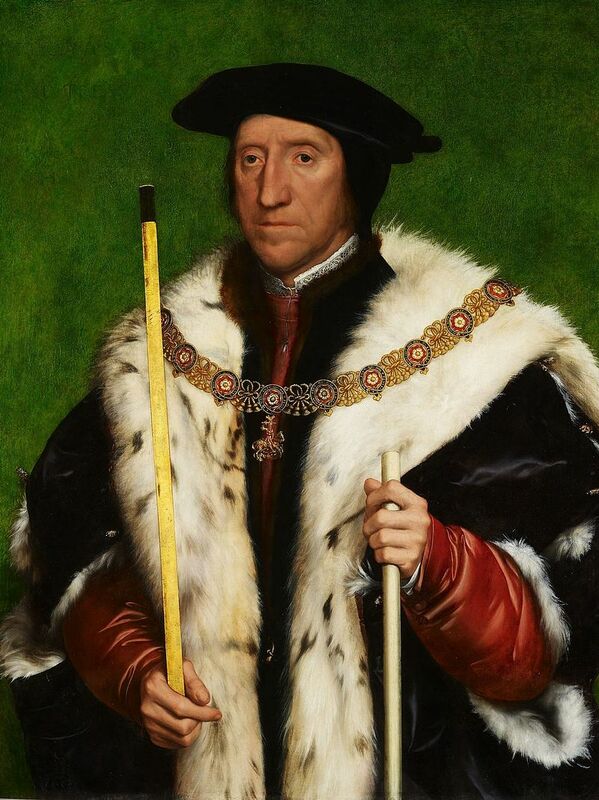 By now Henry sincerely believed in his role as Supreme Head of the Church of England. The question at issue was how he would exercise his power. His conservative counselors persuaded him of the dangers of the growth of radical Protestantism in the country. They pointed out that Anabaptists had been discovered in London, that there were so-called ‘Sacramentarians’ at large. These were people who followed the Swiss reformation’s teaching on the nature of Holy Communion. In 1539, Henry was persuaded to endorse the Act of Six Articles which returned England to unambiguous Catholic doctrinal orthodoxy in matters of faith. And in 1540 Thomas Cromwell, having been accused by his enemies of secretly encouraging heresy, was arrested and swiftly executed. His real crime was in fact the fiasco of having arranged the King’s fourth marriage, his marriage to the German princess Anne of Cleves, which brought Henry into alignment with the Lutheran princes of Germany. Henry, deceived by a flattering portrait, was horrified when Anne of Cleves arrived. He described her as a “Flemish mare.” He refused to consummate the marriage and it was swiftly dissolved. This was a lucky break for Anne of Cleves who retired to estates in eastern England where she happily lived out the rest of her life, so she came out of this quite well [laughter] all things considered. Thomas Cromwell lost his head. Now this phase of events is often portrayed as a return to full Catholic orthodoxy accompanied by a reinvigoration of traditional worship in the parishes. But I think again that goes too far. What was ruling in the late years of Henry was not full Catholic orthodoxy. It was really Henry’s own peculiarly idiosyncratic conscience and desires in matters of religion. Henry would certainly burn the occasional radical Protestant if one was caught, but he also executed the occasional Catholic for opposing the royal supremacy. On one occasion he made a demonstration by having several of each executed on the same day. You can say what you like about Henry, not a nice man, a persecutor, but he was an equal opportunity persecutor. Henry was listening to some of the conservative voices in the council, especially Bishop Gardiner of Winchester and the conservative faction which circulated around Thomas Howard, the Duke of Norfolk. He came under their influence quite heavily in 1540 when Norfolk brought to his attention his young niece, Katherine Howard, who became Henry’s new bride, his fifth wife, pushed into his bed at the age of eighteen by her uncle in the hope of assuring greater influence for his faction. 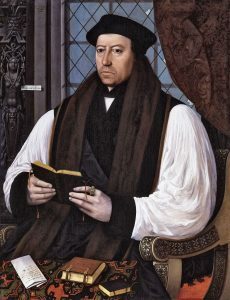 Nevertheless, although Henry was increasingly under the influence of conservative figures, he never lost his trust in Thomas Cranmer and indeed he shielded Cranmer from enemies who would have loved to bring about his fall. And after the discovery of Katherine Howard’s actual adultery in 1542 and her execution, the King was much less influenced by his more conservative advisers. Certainly, the gradual drift of the 1530s in the direction of some kind of neo-Lutheran reform of doctrine had halted, but England’s religion under Henry in his later years was not full orthodoxy. Parish religion was not as it had been. The cult of the saints and the shrines and the relics had been greatly reduced. The cult of purgatory was gone. The monasteries were gone. And on the more positive side a new vernacular religious culture using the English Bible and English service books had come into being. And if really, truly doctrinally Protestant people were still very much a minority they were a growing minority and to some extent a powerful minority. They included some very powerful people whose potential influence was out of all proportion to their numbers. Cranmer was still the archbishop and he favored and helped reformers in the universities and in the church. In 1543, Henry’s last queen, Queen Catherine Parr, who was as much his nurse as his queen, came into a position of authority and she again showed great sympathy towards reform. The so-called Seymour Circle at court, those gathered around Edward and Thomas Seymour, the brothers of Henry’s dead queen, Jane Seymour, and the uncles of young Prince Edward, also favored Protestantism — and above all, perhaps, in their direct influence, the tutors who were appointed to the young Prince Edward and to his sister, Princess Elizabeth, appointed by Archbishop Cranmer, were all closet Protestants. So all of this was the legacy of the Henrician reformation. It had not been a truly Protestant reformation but I think it marked a far more significant break with tradition than is sometimes recognized. Let’s move on now to a fourth phase, the Edwardian reformation. Henry VIII at last died in January 1547, aged only fifty-six though he’d been in a state of some decrepitude for years. And the new king, King Edward, was only nine and a half years old and that of course is another of those contingencies that helped to shape the history of the reformation. Edward’s uncle, Edward Seymour, led a group of reform-minded men in taking control at the center of power. Seymour was appointed protector of the young prince and Duke of Somerset. Now as Duke of Somerset and protector, Seymour and his friends’ prime interest was advancing their own power and influence, but there’s little doubt that he was also of sincere Protestant views and in that context Archbishop Cranmer was able to exercise far more influence than he had since 1539. The changes in religion which were brought about in the next two and a half years suggest a very high degree of commitment of these men at the center. They may not have known in 1547 just how far they were going to go, but they certainly intended to go further than Henry VIII had and they acted swiftly once they had the power. In 1547, Parliament was persuaded to repeal the heresy laws and the Six Articles; no more burning of Protestants. They issued reformist injunctions for the removal of images and the obliteration of religious paintings by whitewashing them in the churches. That’s when those paintings I described to you in Saint Agatha’s Easby were whitewashed, only to be discovered again 400 years later. A book of homilies was issued, official sermons of broadly Lutheran sympathy in their doctrine. Religious guilds and confraternities were suppressed and their goods were confiscated by the crown. In 1548, communion was allowed in ‘both kinds’; that is, both bread and wine were administered to the laity in the Protestant style. 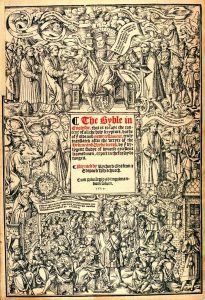 And in 1549 Cranmer issued a prayer book, and an act of uniformity to insist upon its use, which was at least half Protestant in doctrine. That prayer book brought brief rebellion in the west of England, the so-called Prayer Book Rebellion, which centered in the counties of the southwest and led briefly to the siege of Exeter before a royal army arrived to disperse the rebels and to follow their dispersal with the savage repression of this resistance. Something like 4,000 rebels were either killed or executed immediately after the rebellion. As a result, though, Somerset’s dominance in the council was shaken and he was replaced as a central figure by John Dudley, the Duke of Northumberland. That change at the center, however, did not lead to any change in religious policy. In fact, Dudley backed additional innovations in order to keep the support of Archbishop Cranmer and indeed the favor of the young King himself. Edward by this time had emerged as a youth of pronouncedly evangelical Protestant beliefs and inclinations, verging indeed on bigotry. He was often described as the ‘young Josiah’, a biblical figure, the young king who would bring true reform and cleansing of the church. In particular, in 1552 a further prayer book was issued, a revised prayer book, this one decisively and openly Protestant, and it was backed in 1553 by an emphatically Protestant statement of faith, the Forty-two Articles. Let’s take stock. The Church of England under Henry VIII was a peculiarly personal blend of doctrinal orthodoxy with elements of reform in worship and practice. But a true Protestant minority had emerged especially in London and the southeast and among certain powerful members of the social elite, and under the boy king Edward VI and his two regents true Protestant reform moved ahead rapidly over six years. By 1553, the Church of England was clearly Protestant in doctrine and in forms of worship, centered on the English Bible and on the Prayer Book and the nation had become deeply divided in matters of faith. And that leads us to the fifth phase of this process, the Marian Reaction. Edward VI, the boy king, died of pulmonary tuberculosis only a month after the issue of the Protestant Forty-two Articles of Religion and the wheel turned again. 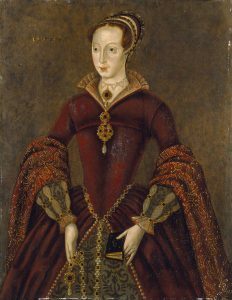 Desperate to avoid loss of power, the Duke of Northumberland proclaimed as queen Lady Jane Grey, the nearest Protestant successor who could be named except Princess Elizabeth, who was left out because she was still stigmatized as illegitimate. Henry VIII’s daughter, Mary, who at this time was living in seclusion in East Anglia, was not willing to accept this. As the daughter of King Henry and of Katherine of Aragon, she raised support amongst the gentry of East Anglia, formed an army and began to move towards London. The Duke of Northumberland lost his nerve. He disbanded his troops, capitulated and gave himself up. So after the turmoil of the previous twenty-five years Mary had become queen after all. The thing Henry had sought so hard to avoid had happened. Now how far Mary’s success in being able to raise troops and finding widespread support for her accession to the crown, how far it was a result of the fact of her Tudor blood and that she clearly was the direct heir, or how far it depended upon the appeal of the fact that she was known to be deeply loyal to the old religion, that’s an open question. But a deeply loyal Catholic she certainly was. Her young life had been blighted by the dissolution of her mother’s marriage and the King’s subsequent actions. She clung, as part of her very identity you could say, to the old religion and her subsequent policies bear the stamp of that. And they also reveal just how divided the nation had become by this stage. 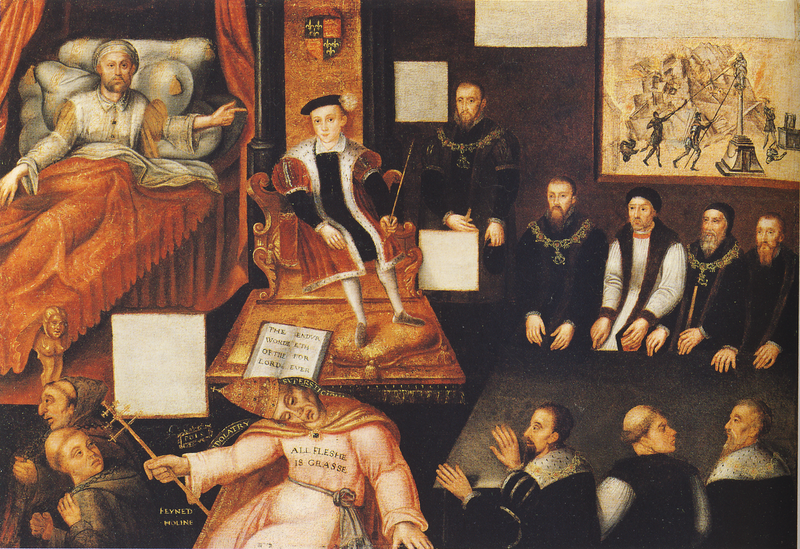 Late in 1553, soon after her accession, Parliament was persuaded to repeal Edward’s Act of Uniformity which had enforced uniform Protestant worship in the nation. Interestingly though, eighty members of Parliament were brave enough to oppose that action. Early in 1554, Mary married. 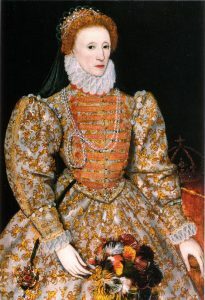 She married Prince Philip of Spain, the future King Philip II, and that marriage was accepted by Parliament, though with great reluctance and only after the suppression of a brief flurry of rebellion in Kent where Sir Thomas Wyatt led a small army to try to seize London and prevent the Spanish marriage. The citizens of London shut the gates against him and he was defeated and executed. Then, in the fall of 1554, full papal jurisdiction was restored in England. 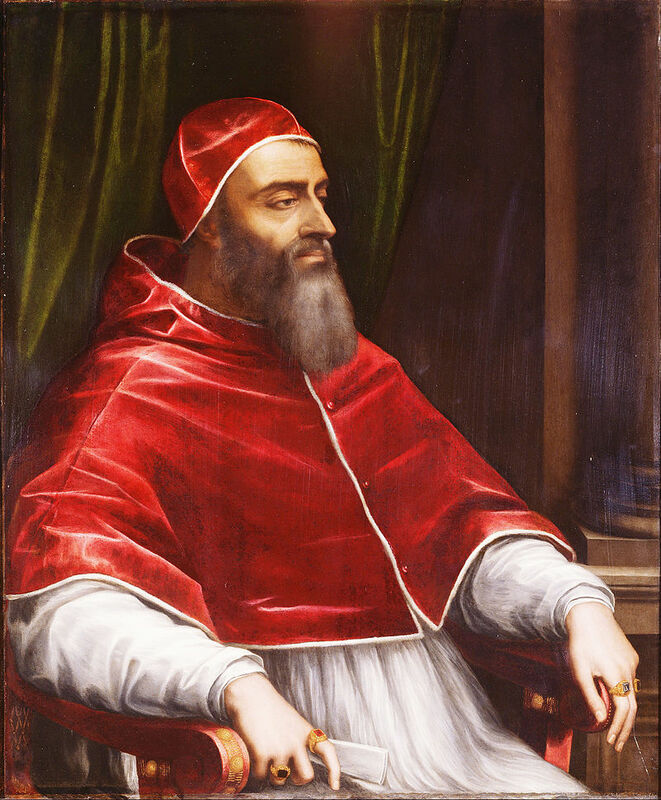 Cardinal Reginald Pole, the great English churchman who had been living in exile in Italy, arrived to absolve the realm from its schism and was appointed Archbishop of Canterbury, but interestingly he was only — the absolution of England from schism — was only accepted after the Pope had agreed that monastery land would remain with those who had been granted it or who had purchased it under Henry VIII. That would not be restored to the church. Archbishop Cranmer was also burned at Oxford in 1556. He had temporally recanted his Protestantism from his fear of death but then went back on his recantation, declared openly his commitment to the new religion and was burned in 1556, holding out into the flames the hand with which he had signed his recantation. “This hand hath offended,” he said. Most of the people who were burned, however, were not the great leaders of the church but humble people, most of them from London and the southeast. In fact, almost half the burnings took place in London, in the city of Colchester and in Canterbury. The southeast was the focus of Protestant strength. They were usually laypeople. Only a tenth of them were clergymen. They were often young. Most of them were under thirty and a very high proportion of those executed were around twenty years old. These were people who had never really known the old religion and who had grown up in the new and proved prepared to die for it. Well, the effects of this holocaust of Protestant resistance are debatable. Certainly Mary, her bishops and her advisers had simply never expected the resistance to be so widespread or so prolonged. But the fact that Mary persisted in her policy to the end really does her no honor. If she had no reason to love her father’s memory, it’s clear at least that she shared his implacability with those who opposed her, and by doing so the persecution helped to cement England’s religious divisions and associated the old religion with a level of persecution that was wholly unprecedented. There had never been religious persecution of this intensity, and indeed it was intense not only by English standards but by the standards of continental Europe at the time. Well, what might have happened given more time we’ll never know, because Mary died in November 1558 aged only forty-two. Christopher Haigh suggests, as have a number of other recent historians, that her reign appears to be an aberration only in hindsight. He thinks she might have succeeded had she been given time. Protestant resistance would have lessened, the old religion would have become reestablished fully and normalized, and perhaps that may well be the case. But there’s also a sense in which one could say her reign was regarded by at least some as a temporary interlude even before her death. Mary was thirty-seven when she came to the throne, thirty-eight when she married a Spanish prince who was usually absent from her, abroad seeing to the affairs of his other possessions. She was childless despite a couple of phantom pregnancies which gave her hope. She had little prospect of bearing an heir, despite her desperate hopes both for herself and for her faith. For Mary all this was undoubtedly a personal tragedy and it’s been suggested that she died in a state of profound depression in her last months. Both those who supported her and those who opposed her knew that in the background was another claimant to the throne, Princess Elizabeth, and that her accession to the throne would almost certainly bring about another alteration in religion. To some degree it could be anticipated well in advance. What they didn’t know, though, was that this time, after the twists and turns of the generation between 1527 and 1558, it would last. And it would last partly because of the nature of the religious settlement which Elizabeth introduced, partly because of the way in which she was able to defend it, and partly for another very simple contingent reason. When Elizabeth was proclaimed queen on the death of her sister on November the 17th, 1558, she was only twenty-five years old and she lived to be seventy.